Since I last updated you all, I’ve taken a few cool trips. The first was to Minca, a little town in the foothills of the Sierra Nevada outside of Santa Marta. Minca is at 600 meters so the cool mountain air was a nice respite from Cartagena’s relentless heat. I stayed in a tiny hostel alongside the river and enjoyed several days of listening to the river flowing while reading and writing. I hiked to the Pozo Azul one day and joined locals and tourists in the cold water that travels down the mountain from some of the tallest peaks in Colombia. I left lots of hikes to do for the next time I visit, because there will surely be a next time! Then, Norbert and I took a short trip to a little town called Rincon del Mar. First, we took a bus to a town called San Onofre. Well, we were so distracted by the beauty of the ride that we missed our stop, but the bus driver was kind enough to pull over and flag down another bus heading back from whence we came. In San Onofre, we hopped on the back of two motorcycles and took a bouncy ride towards the coast. Midway to Rincon del Mar, we were stopped by a group of military men carrying big scary guns, but they were very kind and jovial as they searched our bags for drugs. Apparently, these kinds of searches are very common in these parts of Colombia because of the remote location and the nearness to the sea. One of them practiced their German with Norbert and another sent us away with God’s blessing. At Rincon del Mar, we didn’t have much on our agenda besides relaxing. The next day, we took a boat trip with some fisherman to the nearby Islas de San Bernardo. We snorkeled the reef, visited the world’s most densely populated island, Santa Cruz del Islote, and had a delicious fish lunch on the beach. Once back at the hostel, Norbert made friends with all the village kids by letting them practice flying his kite. This provided immense entertainment for all involved, and I’m not sure who had more fun—Norbert or the kids. That night, we strolled into town for an ice cream and caught a glimpse of a cockfight happening in the town’s center. Apparently it’s a popular activity around this part of Colombia, including on the island we visited. My latest trip was this past weekend to the town of San Basilio de Palenque. This weekend was a “Puente” in Colombia, meaning it was a long weekend. This means full-on fiesta for three long days. (I don’t know how they have the energy!) It was the fiesta patronales de la Virgen del Rosario, and there were lots of festivals happening in the area. 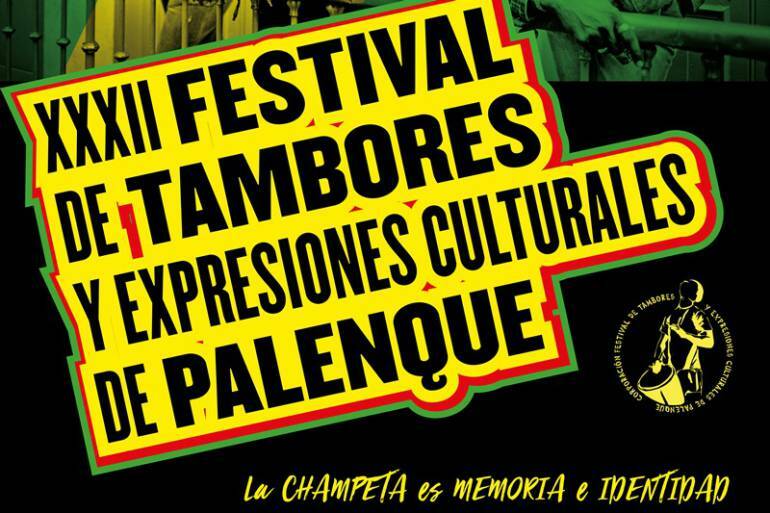 One was a gaita festival in Ovejas and the other was the Festival de los Tambores in Palenque. With a big group of friends from work and from Bella Vista, the hotel where I live, we all headed out to Palenque late on Saturday afternoon. What we found was a tiny village pulsing with drumming and dancing that didn’t stop throughout the whole weekend. The stage was full of dancers and musicians presenting folkloric dances from all over Colombia and beyond! Then there were music groups giving concerts late into the night. Around four in the morning, the sound system turned off and the folkloric groups gathered in the streets for the most important event of the weekend – la arborada. This is when the drummers and dancers parade through the dark streets towards the only hill in town. The celebration continues at the top of the hill as the sun comes up. The idea is to bring the festival to those who live at the top of the hill who might not be able to make it down to take part in the festivities. They bring the festival to them. What a crazy experience. I was only in Palenque for less than 24 hours but I fell in love with the energy and the history of the village. It is considered the first free black village in the Americas and it is said that the women slaves used their hair braids to draw maps and pass on secret messages to the others about the road to Palenque. Hair braiding is still a strong part of their culture. There were signs on houses that read “Hay Pelo,” literally translated as “We Have Hair.” On porches all over the village, you could see women sitting still as their head was woven into intricate braided designs. Although many women offered to braid my hair, it’s something I’ll have to do next time I visit Palenque. I’ll definitely be back! Then, I went straight from Palenque to las Islas del Rosario to begin working on my social project. I’m volunteering with an up-and-coming group of eco-guides in the region of Baru and Islas del Rosario, mostly fishermen and young men from the islands. My job is to help them improve their English so that they can use it to speak to tourists, land more jobs, and give their clients the best experience possible. I am also helping them on the marketing side with photographs, videos, and messages to post on their social media accounts and attract clients. It’s been fun getting to know them and I’m excited to continue working with them over the course of this year. I’m already learning so much about the history of this area as well as the flora and fauna, and I’m lucky that get to be their guinea pig and go on all of their excursions! In case you’re interested in my writing outside of the blog, I’ve had several pieces published in the last few months, so feel free to browse my publications page! I also have several pieces that will appear in print soon. I’ll be sure to pass on the info about how to purchase your copies as soon as I get it! In the meantime, here are some pics of life in Cartagena to entice you guys to come visit us!!!!!!! For more exciting VIDEOS of life in Colombia, please go to my YouTube channel and check out my Colombia playlist!